China – Trade Colossus or Assembly Site? The source for this breakout, incidentally, is a “teardown” performed by the IT market research company iSupply, still accessible at –https://technology.ihs.com/389273/iphone-3g-s-carries-17896-bom-and-manufacturing-cost-isuppli-teardown-reveals. In other words, iSupply physically took apart an iPhone to identify the manufacturers of the components. ..most of the export value and the deficit due to the iPhone are attributed to imported parts and components from third countries and have nothing to do with the PRC. 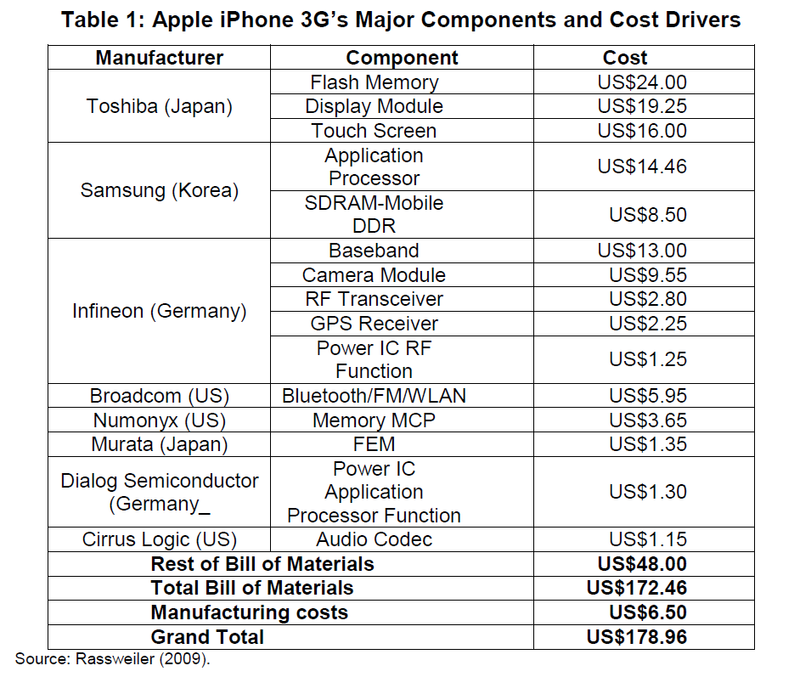 Chinese workers simply put all these parts and components together and contribute only US$6.5 to each iPhone, about 3.6% of the total manufacturing cost (e.g., the shipping price). The traditional way of measuring trade credits all of the US$178.96 to the PRC when an iPhone is shipped to the US, thus exaggerating the export volume as well as the imbalance. Decomposing the value added along the value chain of iPhone manufacturing suggests that, of the US$2.0 billion worth of iPhones exported from the PRC, 96.4% in fact amounts to transfers from Germany (US$326 million), Japan (US$670 million), Korea (US$259 million), the US (US$108 million), and other countries (US$ 542 million). All of these countries are involved in the iPhone production chain. Yuqing Xing builds on the paradox in his more recent China’s High-Tech Exports: The Myth and Reality published in 2014 in MIT’s Asian Economic Papers. Prevailing trade statistics are inconsistent with trade based on global supply chains and mistakenly credit entire values of assembled high-tech products to China. China’s real contribution to the reported 82 percent high-tech exports is labor not technology. High-tech products, mainly made of imported parts and components, should be called “Assembled High-tech.” To accurately measure high-tech exports, the value-added approach should be utilized with detailed analysis on the value chains distributions across countries. Furthermore, if assembly is the only source of value-added by Chinese workers, in terms of technological contribution these assembled high-tech exports are indifferent to labor-intensive products, and so they should be excluded from the high-tech classification. MNEs, in particular Taiwanese IT firms in China, have performed an important role in the rapid expansion of high-tech exports. 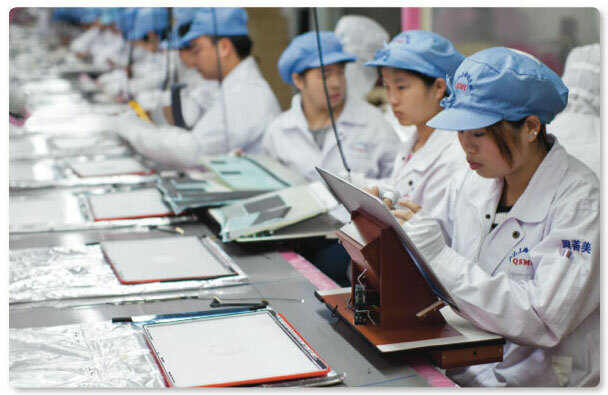 The trend of production fragmentation and outsourcing activities of MNEs in information and communication technology has benefitted China significantly, because of its huge labor endowment. The small share of indigenous firms in high-tech exports implies that China has yet to become a real competitor of the United States, EU, and Japan. That China is the number one high-tech exporter is thus a myth rather than a reality. 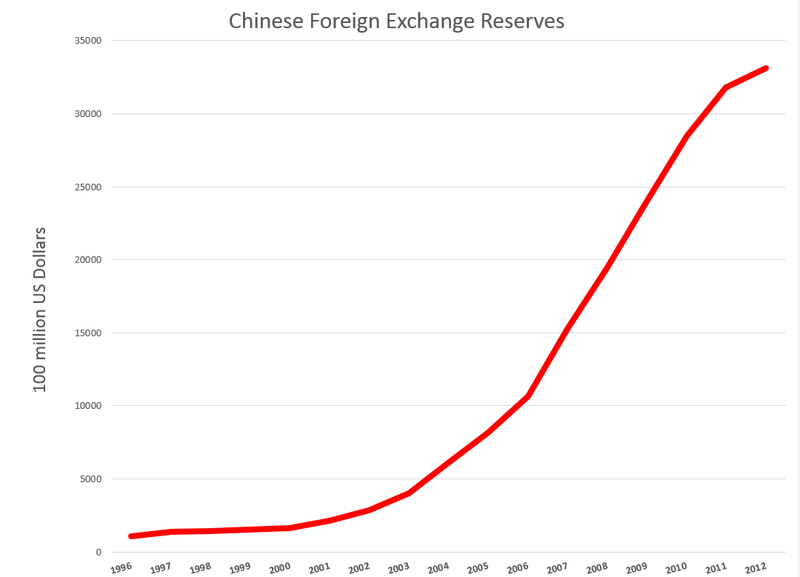 This perspective – that it is really “value-added” that we should focus on, rather than the total dollar volume of trade coming in or going out of a country – is interesting, but I can’t help but think there is a disconnect when you consider actual Chinese foreign exchange reserves, shown below (source – http://www.stats.gov.cn/tjsj/ndsj/2013/indexeh.htm). So currently China holds nearly 3.5 trillion dollars in foreign exchange reserves – most of which, but not all, is comprised of US dollars. This is a huge amount of money, on the order of five percent of total global GDP. How could China have accumulated this merely by being an assembly site for high tech and other products (see Five Facts about Value-Added Exports and Implications for Macroeconomics and Trade Research)? How can this be attributable just to mistakes in counting the origin of the many components in goods coming from China? Don’t those products have to come in and be counted as imports? There is a mystery here, which it would be good to resolve.